The work is an important step with fragile endothelial cells (ECs) made from "induced pluripotent stem cells," or iPSCs, a type of cell that can potentially be made from the cells of any human patient. Because iPSCs can be patient-specific, researchers hope to find ways of using them to generate tissues and replacement organs that can be transplanted without risk of rejection by a patient's immune system. But the fragility of endothelial cells during laboratory growth has limited the utilization of this critical cell type, which is found in all vasculature. "Our work has important therapeutic implications because we demonstrate utilization of human cells and the ability to live-monitor their tubulogenesis potential as they form primitive vessel networks," said study lead author Gisele Calderon, a graduate student in Miller's Physiologic Systems Engineering and Advanced Materials Laboratory. "We've confirmed that these cells have the capacity to form capillary-like structures, both in a natural material called fibrin and in a semisynthetic material called gelatin methacrylate, or GelMA," Calderon said. "The GelMA finding is particularly interesting because it is something we can readily 3-D print for future tissue-engineering applications." Tissue engineering, also known as regenerative medicine, is a field aimed at integrating advances in stem cell biology and materials science to grow transplantable replacement tissues and organs. While tissue engineers have found dozens of ways to coax stems cells into forming specific kinds of cells and tissues, they still cannot grow tissues with vasculature—capillaries and the larger blood vessels that can supply the tissues with life-giving blood. Without vascularization, tissues more than a few millimeters in thickness will die due to lack of nutrients, so finding a way to grow tissues with blood vessels is one of the most sought-after advances in the field. 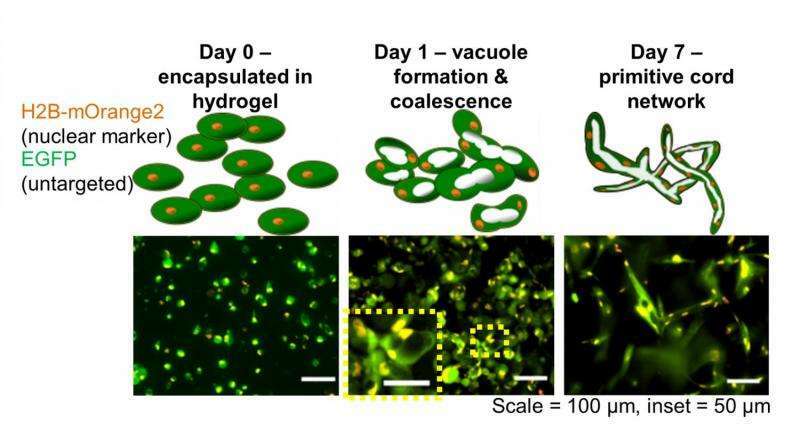 "Ultimately, we'd like to 3-D print with living cells, a process known as 3-D bioprinting, to create fully vascularized tissues for therapeutic applications," said Miller, assistant professor of bioengineering. "To get there, we have to better understand the mechanical and physiological aspects of new blood-vessel formation and the ways that bioprinting impacts those processes. We are using 3-D bioprinting to build tissues with large vessels that we can connect to pumps, and are integrating that strategy with these iPS-ECs to help us form the smallest capillaries to better nourish the new tissue." In the process of tubulogenesis—the first step to making capillaries—endothelial cells undergo a series of changes. First, they form small, empty chambers called vacuoles, and then they connect with neighboring cells, linking the vacuoles together to form endothelial-lined tubes that can eventually become capillaries. "We expect our findings will benefit biological studies of vasculogenesis and will have applications in tissue engineering to prevascularize tissue constructs that are fabricated with advanced photo-patterning and three-dimensional printing," said Dickinson, the Kyle and Josephine Morrow Chair in Molecular Physiology and Biophysics at Baylor College of Medicine and adjunct professor of bioengineering at Rice. 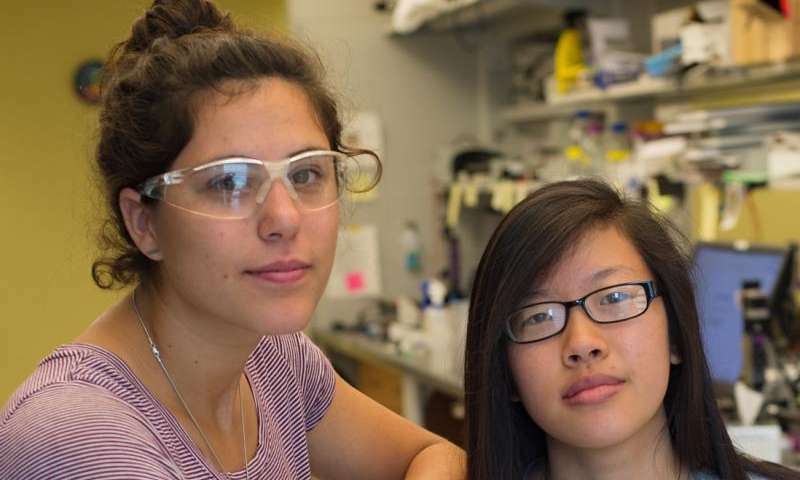 In the study, Calderon, Rice undergraduate Patricia Thai and colleagues investigated whether commercially available endothelial cells grown from iPSCs had tubulogenic potential. The test examined this potential in two types of semisolid gels—fibrin and GelMA. Finally, the researchers also investigated whether a second type of stem cell, human mesenchymal stem cells, could improve the likelihood of tubulogenesis. Calderon said fibrin was chosen for the experiment because it's a natural material that's known to induce tubulogenesis for wound healing. As such, the researchers expected endothelial cells would be induced to form tubules in fibrin. "You could foresee using these three-dimensional, printed tissues to provide a more accurate representation of how our bodies will respond to a drug," Miller said. "Preclinical human testing of new drugs today is done with flat two-dimensional human tissue cultures. But it is well-known that cells often behave differently in three-dimensional tissues than they do in two-dimensional cultures. There's hope that testing drugs in more realistic three-dimensional cultures will lower overall drug development costs. And the potential to build tissue constructs made from a particular patient represents the ultimate test bed for personalized medicine. We could screen dozens of potential drug cocktails on this type of generated tissue sample to identify candidates that will work best for that patient." Angiogenesis is also how many cancers end up growing large enough to kill you.